This section describes the three different views — the Main Calculator view, the About view, and the Settings view — of Yet Another Tip Calculator (YATC), and gives an overview of the functionality on each view. Click on any image below to view it full-size. Subtotal Area The post-tax subtotal, which is entered using the number pad, will be displayed here. Tapping the subtotal area will take you to the Settings view. Tip Percent Picker Wheel Select the desired tip percent (5% – 50%) from this wheel picker. 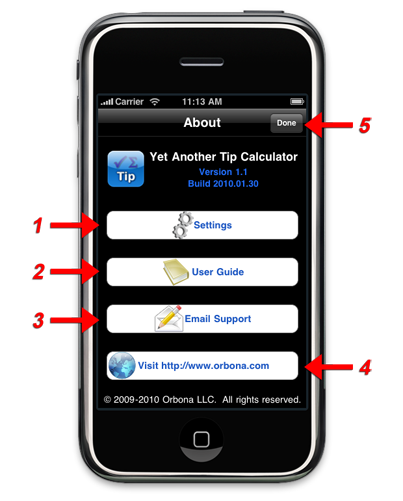 The selected tip percent may differ from the actual tip percent due to rounding and the selected tip calculation method. Results Area The total tip and grand total amount are displayed on the left side of this display. 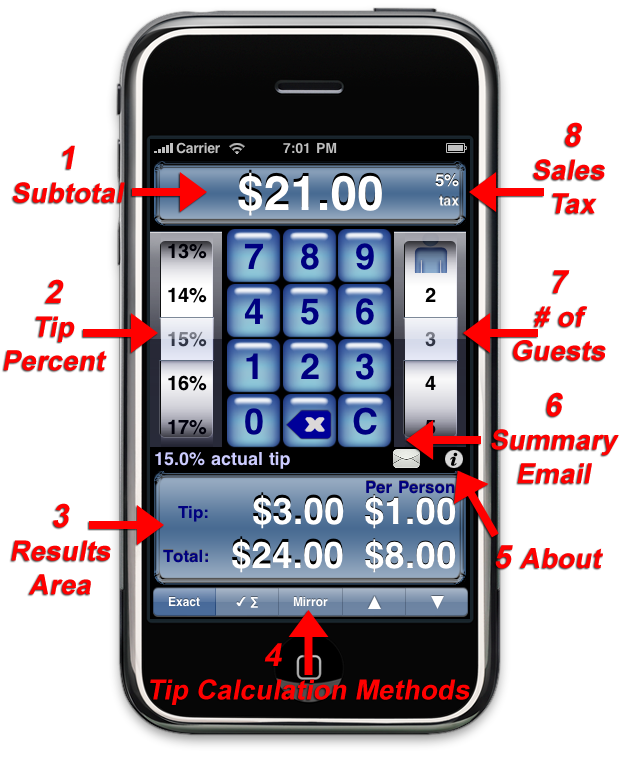 If the number of guests, which is chosen from the right wheel picker (#7), is greater than one, then the per-person tip and total are displayed on the right side. 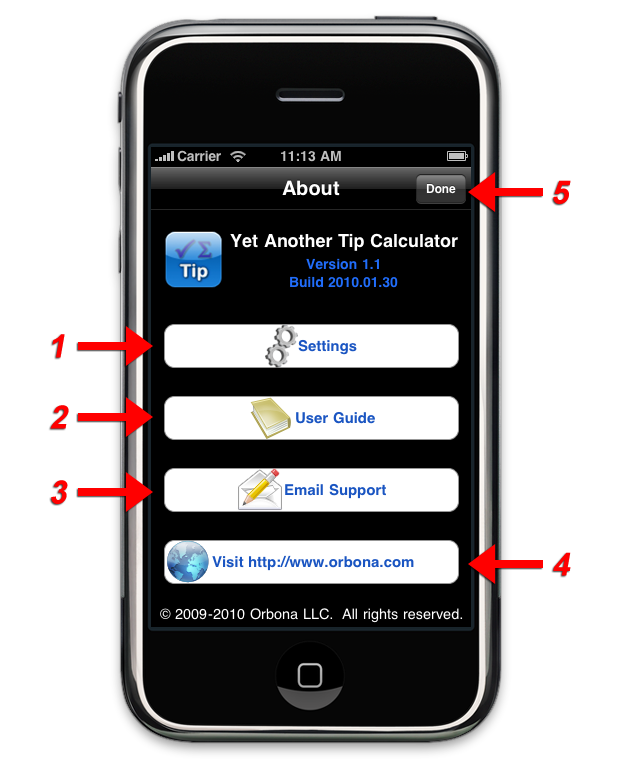 For information about the calculation of these values, please see the Tip Calculation section. 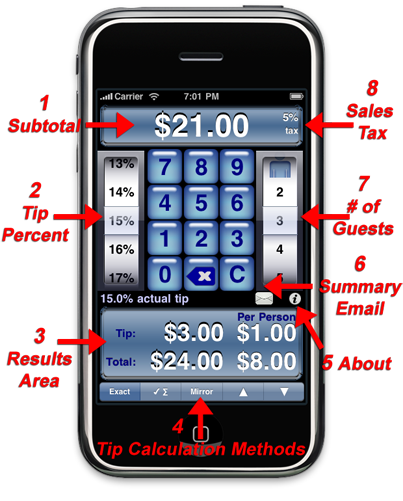 Tip Calculation Method Buttons Choose your tip calculation method from these buttons. About Button Tap this button to go to the About view, where you can continue to the Settings view, email technical support, and read the included User Guide. Summary Email Button Tap this button to email yourself, or any recipient, a summary of your tip transaction. Number of Guests Picker Wheel If you want to split the check evenly, select the number of guests from this picker wheel. You may split the check evenly between 2 – 30 people. Sales Tax If you have turned Tip on Pre-Tax ON, the sales tax you entered will be displayed in the upper right corner of the subtotal area. Both Sales Tax % and Tip on Pre-Tax are configured on the Settings view and are covered in more detail in the Sales Tax section. 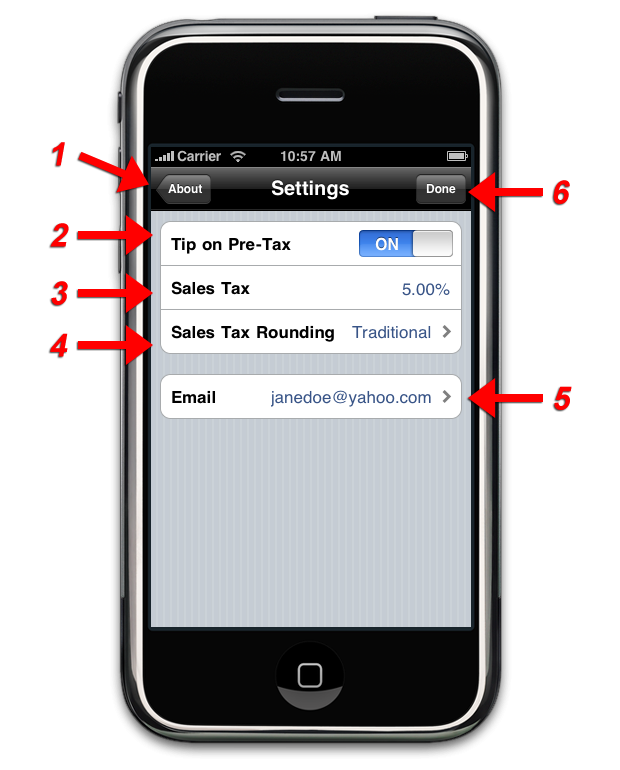 Settings Button Tap this button to go to the Settings view, where you can configure preferences related to sales tax and enter an email address, which is used as the default recipient when emailing a summary of your tip transaction. User Guide Button Tap this button to read the User Guide that is included with the app. Email Support Button Tap this button to submit a bug report or contact technical support. Visit Button Tap this button to launch Safari and visit http://www.orbona.com. Done Button Tap this button to return to the Main Calculator view. About Button Tap this button to return to the About view. Tip on Pre-Tax This setting controls whether the tip is calculated on the pre- or post-tax subtotal. For more information, please see the Sales Tax section. Sales Tax Enter the sales tax rate for your location here. For more information, please see the Sales Tax section. 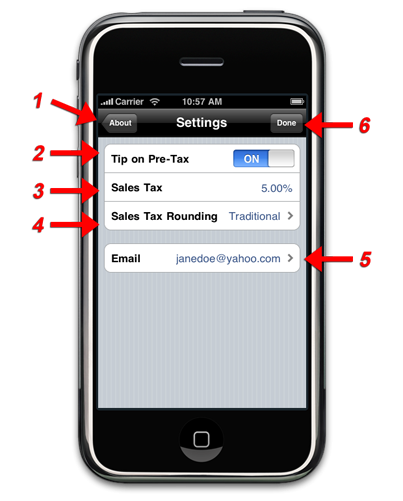 Sales Tax Rounding Select the rounding mode, determined by your local government, that is used for sales tax in your location. For more information, please see the Sales Tax section. Email Address This email address will be used as the default recipient when you email a summary of your tip transaction.